Scientists have demonstrated methods that could see higher-performance computer chips made from tiny straws of carbon called nanotubes. Carbon nanotubes have long been known to have electronic properties superior to current silicon-based devices. But difficulties in manipulating them have hampered nanotube-based chips. The experiments, reported in Nature Nanotechnology, show a kind of two-part epoxy approach to individually place the nanotubes at high density. The race is on in the semiconductor chip industry to replace current silicon technology – methods to make smaller and therefore faster devices will soon come up against physical limits on just how small a silicon device can be. Study co-author James Hannon, a materials scientist at IBM, said that there are few realistic successors to silicon’s throne. “The problem is you have to put it in to production on a 10- or 15-year time scale, so the kinks have to be worked out in the next few years,” he said. Though single nanotubes have shown vastly superior speed and energy characteristics in lab demonstrations, the challenge has been in so-called integration – getting billions of them placed onto a chip with the precision the industry now demands. Current chips are made using lithography, in which large wafers of silicon are layered with other materials of different electronic properties and then devices are simply “etched” out using a focused beam of electrons or charged atoms. To address the integration challenge, Dr Hannon and his colleagues came up with a solution – two of them in fact. The first was a chemical that coats nanotubes and makes them soluble in water. The second was a solution that binds to the first chemical and to the element hafnium, but not to silicon. The team used standard techniques to etch a pattern of channels in hafnium deposited on silicon. Then they simply “double-dipped” the chip into the two solutions – one chemical stuck to the hafnium, and the other chemical acted as the second part of a two-part epoxy, tightly binding nanotubes to the hafnium regions on the chip but not to silicon. The result was a series of neatly aligned nanotube devices, already wired up within the pattern, at a density of a billion per square centimetre. “That’s one nanotube every 150 or 200 (billionths of a metre) or so,” explained Dr Hannon. “That’s not good enough to make a microprocessor yet – it’s a factor of 10 away. The demonstration is a “huge improvement”, but Dr Hannon said several issues are still to be solved. They incude finding more efficient ways to sort through nanotubes – which are made in a wide variety of sizes and types – to select in large quantity and high accuracy the kind suitable for devices. The etching process that sets the ultimate size of a transistor on the chip must also be improved. 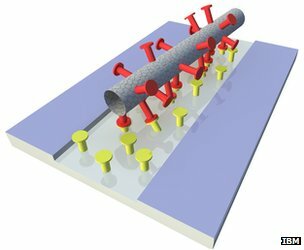 For now, the team has modelled what it can do with the technique in its current form – a vast array of transistors, each comprising six nanotubes spaced 10 nanometres apart. Their models suggest a 10-fold jump in performance – a chip run at more than three times the frequency and consuming just a third the energy. However, in the longer term, nanotube chips would run up against the same limits that silicon faces; as Dr Hannon puts it, “we’re limited by the size of an atom eventually”. Skype ( /ˈskaɪp/) is a proprietary voice-over-Internet Protocol (VoIP) service and software application founded in 2003 by Janus Friis from Denmark and Niklas Zennström from Sweden. It has been owned by Microsoft since 2011. The service allows users to communicate with peers by voice, video, and instant messaging over the Internet. Phone calls may be placed to recipients on the traditional telephone networks. Calls to other users within the Skype service are free of charge, while calls to landline telephones and mobile phones are charged via a debit-based user account system. Skype has also become popular for its additional features, including file transfer, and videoconferencing. Competitors include SIP and H.323-based services, such as Linphone, as well as the Google Talk service, Mumble and Hall.com. Skype has 663 million registered users as of September 2011. The network is operated by Microsoft, which has its Skype division headquarters in Luxembourg. Most of the development team and 44% of the overall employees of the division are situated in Tallinn and Tartu, Estonia. Unlike most other VoIP services, Skype is a hybrid peer-to-peer and client–server system. It makes use of background processing on computers running Skype software. Skype’s original proposed name (Sky Peer-to-Peer) reflects this fact. Some network administrators have banned Skype on corporate, government, home, and education networks, citing reasons such as inappropriate usage of resources, excessive bandwidth usage, and security concerns. Skype has not used it’s potential, to work with local telcos to expand it’s reach, the future is an international online number, where video conferencing and voice calls and sms will merge, to provide the next call centre, the ability to link to corporate websites to have an online customer support experience, where multiple group conferencing will be the norm, I am willing to pay for such a service, and there are many others who will do the same, better go back to the drawing board to plan your next move. Skype Online Numbers = CountryCode+AreaCode+10digit numbers where it is also possible to introduce bidded shortcuts=1-8digit numbers+#(pound) key thru programming. You can even route your calls to your mobile or anywhere in the world. Next how to solve 100 billion devices on the next generation Internet using the matrix system? I can’t be bothered to patent my online numbers, it will be available under a CC Licence when you make money, just reserve a share for me, except those reserved for the UN, I have no choice as I need to patent those inventions, but I won’t even handle the projects, let UN manage and I do my share in research and development. (Reuters) – Intel and Hewlett-Packard Co unveiled new server technology based on the high-end niche Itanium processors at the center of a recent dispute between Hewlett-Packard and Oracle Corp. The future of servers built with Itanium chips was thrown into doubt last year due to a bitter legal battle between long-time partners HP and Oracle and it remains unclear to some experts even after a California state court judge ruled in favor of HP. Intel and HP held a news conference on Thursday announcing the availability of the newest version of Itanium and introducing new HP servers using the chips. HP will keep offering its customers choices between servers based on heavy-duty Itanium chips and Intel’s more widely used “x86” chips, said Ric Lewis, vice president and interim general manager of HP’s Business Critical Systems. Rory McInerney, vice president of Intel’s architecture group said that future Itanium chips would be built using some of the key features found in the company’s more widely used Xeon server processors. He did not say when future chips would be released. Once envisioned as a high-end processor that could become pervasive across the server industry, Itanium suffered a series of setbacks and was eventually overtaken by 64-bit chips based on Intel’s x86 architecture, which is now widely used in the PC industry. Software created for x86 servers is not compatible with Itanium servers, which are mostly sold by HP. In August, a California state court judge ruled in favor of HP and against Oracle over the latter’s decision to end support for servers HP makes using Itanium chips. Oracle has since said it would support Itanium servers. The dispute began after Oracle bought Sun Microsystems, which put Oracle into the server hardware business in competition against its partner, HP. Oracle had said it would no longer make new versions of its database software compatible with Itanium servers because the chip family was nearing the end of its life. Codenamed Paulson, the new Itanium 9500 has up to 2.4 times the performance of the previous generation, has twice as many cores and consumes less power, McInerney said. HP’s Itanium-based servers are mostly used by large corporations with rigorous computing needs.